There must be something in the water in hardware-designer land. Small is en vogue, it seems, and to say we've been intrigued about this latest twist on diminutive form factors would be an understatement. So far, Android has largely (though not exclusively) kept itself firmly in the palms of our hands. But, increasingly it is popping up in places we never even thought about. For the uninitiated, that thing above -- the Chinese-made MK802 -- is a complete "mini PC" that's about the size of a USB flash drive or card reader. 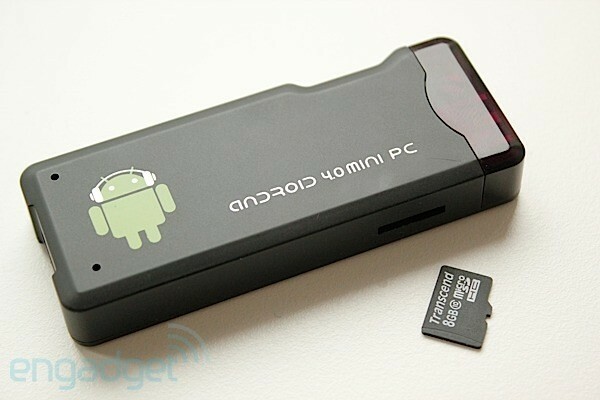 It has a 1.5GHz Allwinner processor, 512MB of RAM and 4GB of onboard flash storage. You can get at these internals via two USB ports (which can also power the device,) and pump the result out to a display via HDMI. If that 4GB of memory isn't enough, you can expand it via a microSD slot. All good and well, but what would you do with such a thing? Plenty is the answer. This not only makes any HDMI display a PC, it also ushers in a new type of portability. Bring your Netflix over to a friend's house without needing your phone, or never worry about using public PCs again. All of these niche uses give the MK802, and its kind, lots of potential. But what is it like in real life? Shimmy past the break to find out. Hardware-wise, there isn't all that much to talk about that we haven't already covered. Unsurprisingly, it is light and plasticky feeling. However, you can imagine that this would be quite safe, being thrown around in the bottom of a bag, or in a key- and coin-filled pocket. It seems a little unfair to say it feels cheap, but then, it is cheap ($74). In the best possible way of course. Set up was easy enough, just plug this little fella into an HDMI port (cable provided) and a USB slot for juice (we used one on the TV, there's the option for a power pack too,) and you're away. It takes a few moments to boot up, but once it does, you're into good old Android (4.0.3). We used a wired mouse in the second USB port which worked straight away with no problems. Another option could be to explore some VNC or remote control applications, but this seemed more complicated than it was worth. A dongle-based wireless mouse might be better. What could also be nice, for later versions, would be Bluetooth support for additional HID options. In use, the only difference to a tablet flavor of Android is the mouse part. In the main it's no problem, and you soon get used to it, but apps where touch -- especially of the "multi" variety -- might not translate so well. All media tasks (HD video, Spotify, YouTube etc,) were handled pretty well. Sometimes there is a bit of a lag on the UI -- especially with things like Google Maps, or busy webpages -- but in general it keeps up nicely. We did have a few frustrating moments when taking power from some USB ports which caused the MK802 to keep restarting, but plug it in to one meant for power, and performance is solid. Out of curiosity, and being the number fetishists that we are, we ran a few quick benchmarks on the wee chap. Now, we didn't go quite as in-depth as we would, say, for a phone, but over all it gave modest, to lower-end results. Quadrant clocked in at around 1238, GL Bench 20fps, and Sun Spider 5075.8, which -- if pushed to measure it against something -- puts it in Panasonic Eluga territory. Back in the real world, it's fair to say that it didn't take long before we got right into the whole Android-on-a-TV thing, and started to wonder about all the apps that might be well suited to this configuration. YouTube is an obvious example, and it worked much better on the MK802 than some native Smart TV apps we've seen. The same is true for things like BBC iPlayer, where the Android interface is sometimes snappier than the TV app. Of course, it's even better when it brings apps to your TV that otherwise might not be available, like Netflix (which does have TV apps, but only certain models). The more time you spend with this, discovering suitable apps, the better it gets, and we could see some really unique uses for it going forward. Right here and now, though, this is neat little solution that will really appeal tinkerers and Android fans. Of course, anything with a processor and some memory instantly has the Linux wolves circling, and this too would be ideal for your favorite install. As mentioned above, media playing works a charm, which is makes it a good light solution for dumb TVs, or those with poor app options. The general population might not have sufficient use for it just yet, but with a few tweaks like a small battery (so it doesn't switch off with the TV,) Bluetooth, or an audio out, this could really gain a lot of fans. But hey, who wants to be part of the gen pop anyway? We're quite taken with it as it is, and are curious to see how the Cotton Candy stacks up against it. In the meantime, you can check the video below to see how it handles various tasks.